Today I received my final Graze box. If you don't know what a Graze box is, go to www.graze.com for full details, but I'll give you a basic overview. Graze is a company who believes that grazing throughout the day on nutritionally balanced and tasty treats is often better than snacking on vending machine chocolate and crisps. You sign up online and you can receive as few as 1 box/week or even order them every day! They are £3.49/box, and there are incentives for recommending a friend like free boxes. They can deliver to your home or to the office, and the boxes are small enough to fit through a letter box. There's no such thing as a typical box as they contain different things every day. You receive four punnets of goodies ranging from flap jacks and cashew nuts, to fruity mixes like the delicious Florentine which contains dark chocolate, cranberries and pumpkin seeds. Each of the punnets is individually sealed and they come in a recyclable cardboard box with a napkin. The snacks are delicious and well balanced. You can even sign up for a super healthy "Nutrition Box" containing only low fat, low GI snacks. The best part about Graze is the personal touch. Each box comes with a little booklet with your name on it (they are so nice that I've kept all of mine!) The booklets tell you exactly what is in your box and gives all the nutritional information. There is a page with some photographs and bits of information about various things such as new recipes and where they source ingredients. You also get four vouchers for free boxes to pass on to friends. I really love receiving my Graze boxes, but whilst I was off sick, I had to put a hold on my account which came off last week. Last night I went online and realised that a box was on its way. Unfortunately I just can't afford to spend £3.49/week on snacks, however tasty or healthy they are, so I had to cancel my subscription. Today I was feeling really crap and down. Money worries, my back, impending bills we all getting to me. I'd also had no breakfast! But then I remembered my final box was due. 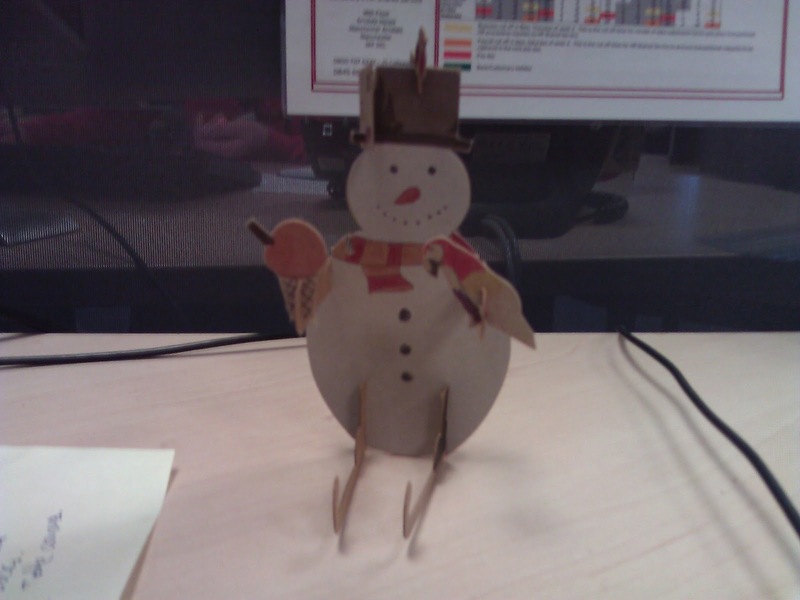 When I opened it, I found a snowman, flat packed in the box on top of my snacks. My mood was immediately improved. I got a lovely booklet with a winter theme and the snowman. 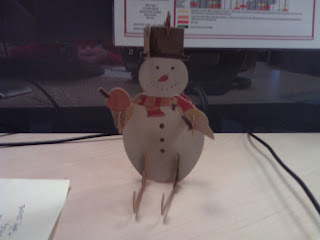 I put him together (I've named him Gary the Graze Snowman) here's a picture of him! I was kind of overwhelmed to be honest, I know it's silly, but it was just such a lovely treat that it put a huge smile on my face. I sent them an email telling them how much I love the service and about how I have to cancel. I always say praise where praise is due. So imagine my surprise when I received a reply offering me a complimentary box! This is a good company! I know this sounds like one big advert, but like I said before, praise where praise is due. Give it a try and if you do, quote reference DG2FJY83 and you'll get your first box free!